A greenhouse is an area where plants are grown in a controlled atmosphere. Greenhouses recreate the environment necessary for plants to grow year round in areas where that would not be possible otherwise. Humidity, temperature and sterility are all environmental conditions kept at a constant by a greenhouse. Heating in the greenhouse is supported by the science of thermostatistics. Thermostatistics deals with heat transfer and the thermal properties of materials says Colorado State University. The units of heat used in thermostatistics are the British thermal unit (Btu) or Horsepower (hp). One Btu is the amount of energy needed to raise the temperature of 1 pound of water 1 degree Fahrenheit. Horsepower is another measurement, one hp equaling 33,475 Btu. Greenhouses use conduction to spread and keep heat throughout the structure. Energy flows in a greenhouse from higher energy molecules or warmer materials to lower energy, or cooler molecules. 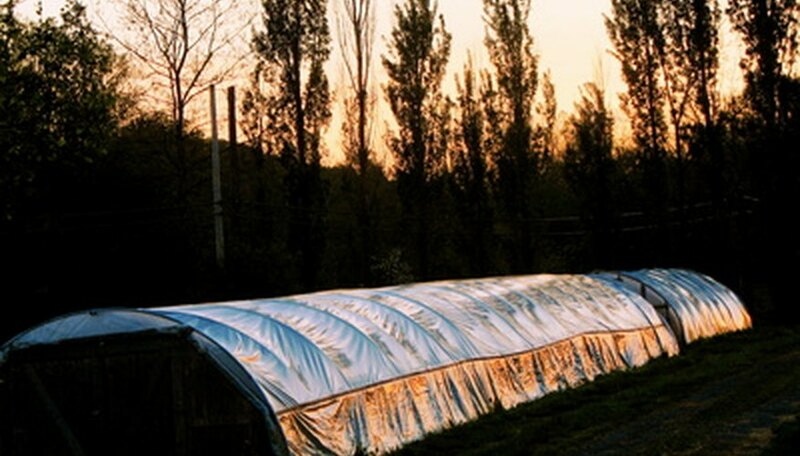 Greenhouses use radiation, or the traveling of heat through another material that does not absorb it, to heat the environment. Most greenhouses provide a sterile environment for the plants to grow in. The introductions of pathogens into the environment can cause disease and the death of plants. Plugs or transplants, shoes or guests to the greenhouse may cause contamination. Irrigation water may be a culprit. It is necessary to keep the area sterilized. Humidity keeps a plant healthy, but too much of a good thing may ruin the greenhouse environment. Humidity provides extra moisture to the plant and keeps leaves green and healthy. A greenhouse that is too hot may cause evaporation of water used for irrigation, causing excessive vapor. When a fungal spore is added to an excessively humid environment it will spread out of control. Proper watering and plant placement within the greenhouse will prevent high humidity from occurring. Clean up puddles of water from the greenhouse daily to prevent it from evaporating. Remove perspiration from plant canopies and keep the plants spaced properly to prevent meshed plant canopies says the University of Massachusetts.